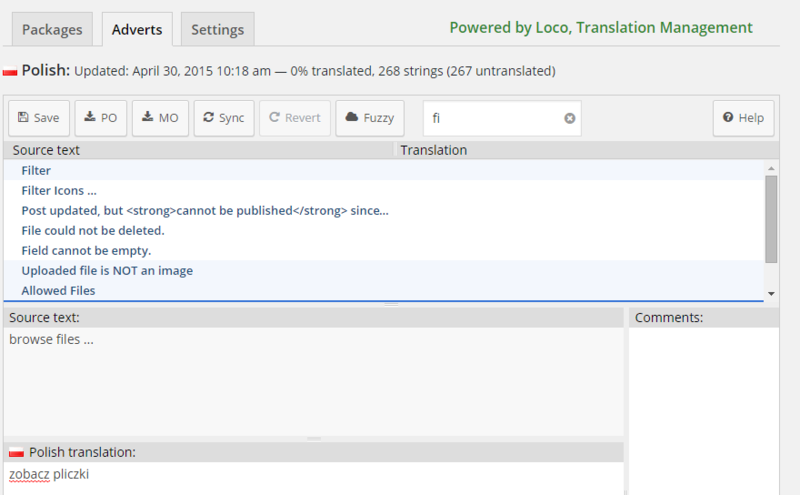 Adverts can be translated to any language (including RTL languages) like any other WordPress plugin, the easiest way to do this is to use Loco Translate plugin, it will generate po/mo files from your current WPAdverts version. This tutorial applies to all our add-ons as well, the only difference is that in second step you need to select your add-on instead of WPAdverts. 2. Once you have the plugin installed and activated go to wp-admin / Loco Translate / Manage Translations panel, scroll down to WPAdverts and click “New Language” button next to it (see screenshot below). Important! If you do NOT want your translation files overwritten on WPAdverts update check the “create in global languages directory” radio button. from wp-content/plugins/wpadverts/languages directory download adverts.pot file to your computer. finally upload your po and mo files back to wp-content/plugins/wpadverts/languages directory or to wp-content/languages/plugins (recommended) if you do not want your files to be overwritten on WPAdverts update. If you would like other users to be able to use your translation feel free to send us link your .po/.mo files using our contact form.